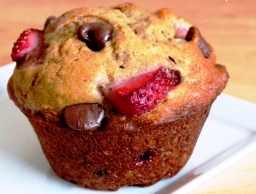 Here's a great muffin for you to try, wonderfully delicious fresh chopped strawberries, ripe bananas and mouth-watering chocolate chips combined to please anyone who loves homemade muffins. Preheat oven to 350 degrees F/180 degrees C. Grease a 16 cup muffin pan or place 16 paper muffin cup liners in muffin pan. In another bowl, whisk the egg, oil, sour cream (or plain yogurt can be used) and vanilla. Stir into dry ingredients just until moistened. Fold in bananas, chopped strawberries and chocolate chips. Fill greased or paper-lined muffin cups two-thirds full. Bake in preheated oven for 22-25 minutes or until a toothpick inserted near the center comes out clean (toothpick inserted into center of muffin may be a bit moist and gooey because of using fresh chopped strawberries, but that's alright). Cool for 5 minutes before removing from pans to wire racks to cool completely. Already tried it.... tastes goooood!! Visit www.madebysiany.com to see the result.. I made this recipe omitting the chocolate chips. It was delicious. My family loved the muffins. I think next time I may add some chopped pecans. Very easy to make and not expensive...30 minutes or less and you have a great treat. Very moist and tasty. This recipe is amazingly delicious! It is very moist and tasty. Make sure to add the maximum amount of strawberries. The flavor of the bananas can overpower the strawberries. Walnuts are great in this recipe too. To sum your recipe up in one word "awesome"! I just made these muffins and they are soooo good. Thanks! My daughters and I just made these muffins and they are amazing! Thanks for the recipe. I will be visiting often.